Tesla with his magnifying generator capable of sending millions of electric volts 22 feet. Nikola Tesla was born July 9/10, 1856 at Smiljan, Croatia. He emigrated to the United States in 1884 and sold the patent rights to his system of alternating-current dynamos, transformers, and motors to George Westinghouse the following year. 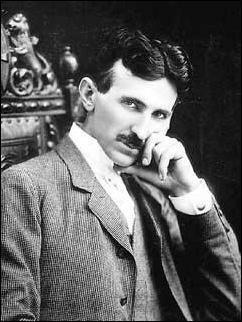 In 1891 he invented the Tesla coil, an induction coil widely used in radio technology. Tesla (left) was from a family of Serbian origin. His father was an Orthodox priest; his mother was unschooled but highly intelligent. A dreamer with a poetic touch, as he matured Tesla added to these earlier qualities those of self-discipline and a desire for precision. Training for an engineering career, he attended the Technical University at Graz, Austria, and the University of Prague. At Graz he first saw the Gramme dynamo, which operated as a generator and, when reversed, became an electric motor, and he conceived a way to use alternating current to advantage. Nikola Tesla, then twenty-eight, had been forced to give up his studies at the Austrian Polytechnic School in Graz due to lack of funds. During his studies he had taken special interest in AC devices, and the flaws inherent in their design. One day in 1882, while talking to a friend in a Belgrade park, Tesla abruptly froze in mid-step and mid-sentence. A new concept of AC equipment, long forming in the background of his thoughts, had suddenly crystallized in his mind. His friend wanted to help him to a bench to sit down, but Tesla refused to relax until he had traced a drawing of a new AC motor design in the sand. He visualized the principle of the rotating magnetic field and developed plans for an induction motor that would become his first step toward the successful utilization of alternating current. That year Tesla went to work in Paris for the Continental Edison Company, and, while on assignment to Strassburg in 1883, he constructed, in after-work hours, his first induction motor. Tesla sailed for America in 1884, arriving in New York, with four cents in his pocket, a few of his own poems, and calculations for a flying machine. He first found employment with Thomas Edison, but the two inventors were far apart in background and methods, and their separation was inevitable. Thomas Alva Edison did not fully understand the light bulbs that he himself had invented. Though the carbon filaments would work from AC or DC current equally well, Edison himself believed his electric lights would only work with DC. It was many years before he learned of his error. In any event, when Tesla first arrived in America in 1884, Edison had a large vested interest - both financial and emotional - in the DC power plants which he had been building, and which the "robber baron" J. Pierpont Morgan had been financing. Therefore, when Tesla arrived in the United States and sought Edison's backing for his new AC devices, Edison refused to listen. "Hold up! Spare me that nonsense. It's dangerous. We're set up for direct current in America. People like it, and it's all I'll ever fool with. "Nonetheless Edison offered him a job, promising Tesla fifty thousand dollars if Tesla could redesign Edison's breakdown-prone DC generator designs. Tesla agreed and worked for the better part of a year redesigning the dynamos, also adding new automatic controls of Tesla's own design. The new generator designs were a vast improvement over Edison's originals. Upon completing the job Tesla went to Edison to collect the $50,000 promised for the task. "Tesla," Edison replied, "you don't understand our American humor." Tesla was never paid. Edison couldn't stand Tesla for several reasons. One was that Tesla showed up for work every day in formal dress... morning coat, spats, top hat and gloves, and this just wasn't the American Way at the time. Edison also hated Tesla because Tesla invented so many things while wearing these clothes." Tesla soon found himself unemployed, and for a time he worked as a laborer on a New York street gang to keep from starving. In time, however, he was fortunate enough to find a financial backer for his AC work. Soon he was able to apply for patents for his polyphase AC motors, distribution systems, and transformers. Word of the extraordinary patents reached the academic world, and so it came to pass that the inventor was invited to lecture before the American Institute of Electrical Engineers. Tesla's presentation and ideas were lauded at the time as remarkably new, lucid, thorough, and far-reaching in ramifications, and were discussed widely by engineers. So it was that Tesla came to the attention of business magnate George Westinghouse. In May 1885, George Westinghouse (right), head of the Westinghouse Electric Company in Pittsburgh, already understood the advantages of AC electricity, and had been one of its' early advocates. He had dreamed of someday being able to provide electricity throughout the country, but the technology to do so reliably had not yet existed. Learning of Tesla's successes, Westinghouse found what he needed to make that dream a reality. In May 1885, Westinghouse purchased the patents to Tesla's polyphase AC systems, and hired Tesla as a consultant as well. One account says that he handed Tesla a $ million check, but Tesla tore it up, because he wasn't that concerned about money. He wanted people to have the benefits of his inventions. The agreements between Westinghouse and Tesla called for the businessman to pay the inventor a royalty of two dollars and fifty cents - for every horsepower of AC equipment sold. Even a century ago, the royalties would be enough to make Tesla one of the wealthiest men in the world. (Were such royalties to be paid on equipment in use today, the royalties on AC generators alone would be worth more than seven and a half billion dollars.) Westinghouse then began to develop AC systems across the country, systems which are now in use throughout the entire world. The transaction precipitated a titanic power struggle between Edison's direct-current systems and the Tesla-Westinghouse alternating-current approach, which eventually won out. Tesla soon established his own laboratory, where his inventive mind could be given free rein. He experimented with shadowgraphs similar to those that later were to be used by Wilhelm Röntgen when he discovered X-rays in 1895. Tesla's countless experiments included work on a carbon button lamp, on the power of electrical resonance, and on various types of lighting. Meanwhile, dogs and cats began disappearing from the neighborhood around Edison's laboratory in West Orange, New Jersey. 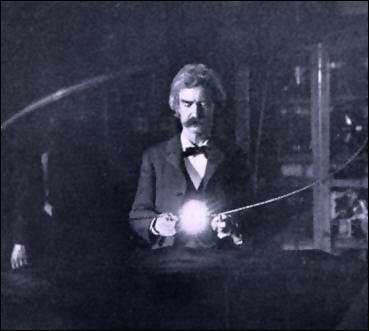 Unable to challenge AC electricity on technical merits, Edison (left) turned to using scare tactics instead. "Just as certain as death [AC power] will kill a customer within six months," he declared. Leaflets about the dangers of AC current were printed and distributed. Lobbying efforts were made in New York State to limit legal levels of electricity to 800 volts, making AC distribution impractical "as a matter of public safety". Perhaps most horrifying, though, were Edison's weekend demonstrations of the dangers of Tesla's work. Taking one of the frightened pets stolen from the streets of West Orange, Edison would place it on a sheet of metal, bring forth two wires attached to an AC generator, and announce to spectators, "Ladies and gentlemen, I shall now demonstrate the effects of AC current on this dog." Edison's efforts to discredit AC electricity were, in the long run, unsuccessful. This did not, however, make Edison's lies or killings any less repugnant. The race was on between Morgan (right) and Westinghouse to determine who would control the future of electricity in America. Morgan didn't care what kind of electricity was used, as long as he was in control of it - and he controlled Edison's DC patents. Westinghouse retained his faith that AC was the superior and more cost-effective system, and should be used for that reason, if no other. One of Morgan's managers, Charles Coffin, proudly boasted of his tactics to gain ground for Morgan and Consolidated Edison (later to become General Electric). He described raising the price of Edison-built streetlights from $6.00 to $8.00, specifically to raise an extra $2 per streetlight to pay off local politicians. He also advocated getting generators and distribution systems installed quickly, the advantage being that "the users willingly pay our price [for power in the future] as they cannot afford to change the system." Westinghouse made it clear that he and Coffin did not share their style of doing business. The House of Morgan therefore went after Westinghouse in a different manner, spreading rumors to Wall Street investors that Westinghouse's finances were unstable. Investors began to shy away from providing Westinghouse with new capital, capital being the lifeblood of his efforts to implement AC. Eventually it became clear that, if AC and the Westinghouse business were to survive, the remarkable royalty contract between Westinghouse and Tesla would have to be drastically altered. Westinghouse came to Tesla and described the situation. Tesla replied with these words: "Mr. Westinghouse, you have been my friend, you believed in me when others had no faith; you were brave enough to go ahead... when others lacked courage; you supported me when even your own engineers lacked vision... you have stood by me as a friend..."Here is your contract, and here is my contract. I will tear both of them to pieces, and you will no longer have any troubles from my royalties. Is that sufficient?" Tesla gave exhibitions in his laboratory in which he lighted lamps without wires by allowing electricity to flow through his body, to allay fears of alternating current. He was often invited to lecture at home and abroad. The Tesla coil, which he invented in 1891, is widely used today in radio and television sets and other electronic equipment. In his lab Tesla (right) demonstrates wireless transmissions. Westinghouse used Tesla's system to light the World's Columbian Exposition at Chicago in 1893. His success was a factor in winning him the contract to install the first power machinery at Niagara Falls, which bore Tesla's name and patent numbers. The project carried power to Buffalo by 1896. In 1890 Tesla announced his invention of a tele-automatic boat guided by remote control. When skepticism was voiced, Tesla proved his claims about it before a crowd in Madison Square Garden. Tesla wanted an extraordinary way to demonstrate the potential of his system for wireless transmission of energy [radio]. In 1898, at an electrical exhibition in the recently completed Madison Square Garden, he made a demonstration of the world's first radio-controlled vessel (left). Everyone expected surprises from Tesla, but few were prepared for the sight of a small, odd-looking, iron-hulled boat scooting across an indoor pond (specially built for the display). The boat was equipped with, as Tesla described, "a borrowed mind." When a New York Times writer suggested that Tesla could make the boat submerge and carry dynamite as a weapon of war, the inventor himself exploded. Tesla quickly corrected the reporter: "You do not see there a wireless torpedo, you see there the first of a race of robots, mechanical men which will do the laborious work of the human race." Tesla's device was literally the birth of robotics, though he is seldom recognized for this accomplishment. The inventor was trained in electrical and mechanical engineering, and these skills merged beautifully in this remote-controlled boat. Unfortunately, the invention was so far ahead of its time that those who observed it could not imagine its practical applications. Colorado Springs below Pike's Peak. In Colorado Springs, Colo., where he stayed from May 1899 until early 1900, Tesla made what he regarded as his most important discovery-- terrestrial stationary waves. By this discovery he proved that the Earth could be used as a conductor and would be as responsive as a tuning fork to electrical vibrations of a certain frequency. He also lighted 200 lamps without wires from a distance of 25 miles (40 kilometers) and created man-made lightning, producing flashes measuring 135 feet (41 meters). At one time he was certain he had received signals from another planet in his Colorado laboratory, a claim that was met with derision in some scientific journals. In the midst of Colorado's own incredible electrical displays, Tesla would sit taking measurements. He soon found the earth to be "literally alive with electrical vibrations." Tesla came to think that when lightning struck the ground it set up powerful waves that moved from one side of the earth to the other. If the earth was indeed a great conductor, Tesla hypothesized that he could transmit unlimited amounts of power to any place on earth with virtually no loss. But to test this theory, he would have to become the first man to create electrical effects on the scale of lightning. The laboratory that rose from the prairie floor was both wired and weird, a contraption with a roof that rolled back to prevent it from catching fire, and a wooden tower that soared up eighty feet. Above it was a 142-foot metal mast supporting a large copper ball. Inside the strange wooden structure, technicians began to assemble an enormous Tesla coil, specially designed to send powerful electrical impulses into the earth. On the evening of the experiment, each piece of equipment was first carefully checked. Then Tesla alerted his mechanic, Czito, to open the switch for only one second. The secondary coil began to sparkle and crack and an eerie blue corona formed in the air around it. Satisfied with the result, Tesla ordered Czito to close the switch until told to cease. Huge arcs of blue electricity snaked up and down the center coil. Bolts of man-made lightning more than a hundred feet in length shot out from the mast atop the station. Tesla's experiment burned out the dynamo at the El Paso Electric Company and the entire city lost power. The power station manager was livid, and insisted that Tesla pay for and repair the damage. When Tesla returned from Colorado Springs to New York, he wrote a sensational article for Century Magazine in which he detailed his vision of tapping the sun's energy with an antenna. He suggested that it would be possible to control the weather with electrical energy and predicted machines that would make war an impossibility. He proposed a global system of wireless communications that to most people were almost incomprehensible, but Tesla was a man who had already proved his abilities. The article caught the attention of the powerful investor J. P. Morgan. A frequent guest in Morgan's home, Tesla proposed a world system of wireless communications to relay telephone messages across the ocean to broadcast news, music, stock market reports, private messages, secure military communications, and even pictures to any part of the world. "When wireless is fully applied the earth will be converted into a huge brain, capable of response in every one of its parts," Tesla told Morgan. 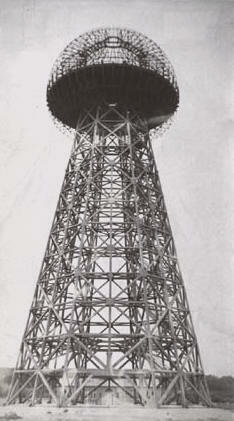 With Morgan's financial backing, Tesla began construction on Long Island of a wireless world broadcasting tower. Tesla claimed he secured the $150,000 loan by assigning 51 percent of his patent rights of telephony and telegraphy to Morgan. A more realistic sum would have been $1,000,000, but Tesla took what was available and went to work. Tesla's actual plan was to make a large-scale demonstration of electrical power transmission without wires. He acquired land on the cliffs of Long Island Sound. The site was called Wardenclyffe. By 1901 the Wardenclyffe (right) project was under construction, the most challenging task being the erection of an enormous tower, rising 187 feet in the air and supporting on its top a fifty-five-ton sphere made of steel. Beneath the tower, a well-like shaft plunged 120 feet into the ground. Sixteen iron pipes were driven three hundred feet deeper so that currents could pass through them and seize hold of the earth. "In this system that I have invented," Tesla explained, "it is necessary for the machine to get a grip of the earth, otherwise it cannot shake the earth. It has to have a grip... so that the whole of this globe can quiver. ",He expected to provide worldwide communication, but the project was abandoned because of a financial panic, labor troubles, Marconi's wireless (1901) break through, and Morgan's withdrawal of support. The tower was completed in 1904, but it was Tesla's greatest defeat. In 1905, after some amazing electrical displays, Tesla and his team had to abandon the project forever. Newspapers called it, "Tesla's million dollar folly." Humiliated and discouraged, Tesla experienced a complete nervous breakdown. "It is not a dream," he protested. "It is a simple feat of scientific electrical engineering, only expensive... blind, faint-hearted, doubting world." Eventually he shifted his work to turbines and other projects. Because of a lack of funds, his ideas remained in his notebooks, which are still examined by engineers for unexploited clues. In 1915 he was severely disappointed when a report that he and Edison were to share the Nobel Prize proved erroneous. Tesla was the recipient of the Edison Medal in 1917, the highest honor that the American Institute of Electrical Engineers could bestow. Tesla's career demonstrates that no patent is really safe. In 1900, the Marconi Wireless Telegraph Company, Ltd. began thriving in the stock markets—due primarily to Marconi's family connections with English aristocracy. British Marconi stock soared from $3 to $22 per share and the glamorous young Italian nobleman was internationally acclaimed. Both Edison and Andrew Carnegie invested in Marconi and Edison became a consulting engineer of American Marconi. Then, on December 12, 1901, Marconi for the first time transmitted and received signals across the Atlantic Ocean. Otis Pond, an engineer then working for Tesla, said, "Looks as if Marconi got the jump on you." Tesla replied, "Marconi is a good fellow. Let him continue. He is using seventeen of my patents." But Tesla's calm confidence was shattered in 1904, when the U.S. Patent Office suddenly and surprisingly reversed its previous decisions and gave Marconi a patent for the invention of radio. The reasons for this have never been fully explained, but the powerful financial backing for Marconi in the United States suggests one possible explanation. Tesla was embroiled in other problems at the time, but when Marconi won the Nobel Prize in 1911, Tesla was furious. He sued the Marconi Company for infringement in 1915, but was in no financial condition to litigate a case against a major corporation. It wasn't until 1943—a few months after Tesla's death— that the U.S. Supreme Court upheld Tesla's radio patent number 645,576. The Court had a selfish reason for doing so. The Marconi Company was suing the United States Government for use of its patents in World War I. The Court simply avoided the action by restoring the priority of Tesla's patent over Marconi. Tesla's business with the U. S. Patent Office was still not finished. In 1928, at the age of seventy-two, he received his last patent, number 6,555,114, "Apparatus For Aerial Transportation." This brilliantly designed flying machine (right) resembled both a helicopter and an airplane. According to the inventor, the device would weigh eight-hundred pounds. It would rise from a garage, a roof, or a window as desired, and would sell at $1,000 for both military and consumer uses. This novel invention was the progenitor of today's tiltrotor or VSTOL (vertical short takeoff and landing) plane. Unfortunately, Tesla never had the money to build a prototype. Tesla allowed himself only a few close friends. Among them were the writers Robert Underwood Johnson, Mark Twain (in Tesla's lab at left), and Francis Marion Crawford. He was quite impractical in financial matters and an eccentric, driven by compulsions and a progressive germ phobia. But he had a way of intuitively sensing hidden scientific secrets and employing his inventive talent to prove his hypotheses. Tesla was a godsend to reporters who sought sensational copy but a problem to editors who were uncertain how seriously his futuristic prophecies should be regarded. Caustic criticism greeted his speculations concerning communication with other planets, his assertions that he could split the Earth like an apple, and his claim of having invented a death ray capable of destroying 10,000 airplanes at a distance of 250 miles (400 kilometers). Tesla inherited from his father a deep hatred of war. Throughout his life, he sought a technological way to end warfare. He thought that war could be converted into, "a mere spectacle of machines." In 1931 Tesla announced to reporters at a press conference that he was on the verge of discovering an entirely new source of energy. Asked to explain the nature of the power, he replied, "The idea first came upon me as a tremendous shock... I can only say at this time that it will come from an entirely new and unsuspected source." War clouds were again darkening Europe. On 11 July 1934 the headline on the front page of the New York Times read, "TESLA, AT 78, BARES NEW 'DEATH BEAM.'" The article reported that the new invention "will send concentrated beams of particles through the free air, of such tremendous energy that they will bring down a fleet of 10,000 enemy airplanes at a distance of 250 miles..." Tesla stated that the death beam would make war impossible by offering every country an "invisible Chinese wall." The idea generated considerable interest and controversy. Tesla went immediately to J. P. Morgan, Jr. in search of financing to build a prototype of his invention. Morgan was unconvinced. Tesla also attempted to deal directly with Prime Minister Neville Chamberlain of Great Britain. But when Chamberlain resigned upon discovering that he had been out-maneuvered by Hitler at Munich, interest in Tesla's anti-war weapon eventually collapsed. By 1937 it was clear that war would soon break out in Europe. Frustrated in his attempts to generate interest and financing for his "peace beam" (right), he sent an elaborate technical paper, including diagrams, to a number of Allied nations including the United States, Canada, England, France, the Soviet Union, and Yugoslavia. Titled "New Art of Projecting Concentrated Non-Dispersive Energy Through Natural Media," the paper provided the first technical description of what is today called a charged particle beam weapon. What set Tesla's proposal apart from the usual run of fantasy "death rays" was a unique vacuum chamber with one end open to the atmosphere. Tesla devised a unique vacuum seal by directing a high-velocity air stream at the tip of his gun to maintain "high vacua." The necessary pumping action would be accomplished with a large Tesla turbine. Of all the countries to receive Tesla's proposal, the greatest interest came from the Soviet Union. In 1937 Tesla presented a plan to the Amtorg Trading Corporation, an alleged Soviet arms front in New York City. Two years later, in 1939, one stage of the plan was tested in the USSR and Tesla received a check for $25,000. Tesla hoped that his invention would be used for purely defensive purposes, and thus would become an anti-war machine. His system required a series of power plants located along a country's coast that would scan the skies in search of enemy aircraft. Since the beam was projected in a straight line, it was only effective for about 200 miles — the distance of the curvature of the earth. Most experts today consider his idea infeasible. Though, his death beam bears an uncanny resemblance to the charged-particle beam weapon developed by both the United States and the Soviet Union during the cold war. Tesla died January 7, 1943 in New York City at 86. He was widely respected as America's greatest electrical engineer. Much of his early work pioneered modern electrical engineering and many of his discoveries were of groundbreaking importance. During this period, in the United States, Tesla's fame rivaled that of any other inventor or scientist in history or popular culture, but due to his eccentric personality and unbelievable and sometimes bizarre claims about possible scientific and technological developments, Tesla was ultimately ostracized and regarded as a mad scientist. Never having put much focus on his finances, Tesla died impoverished. Hundreds filed into New York City's Cathedral of St. John the Divine for his funeral services, and a flood of messages acknowledged the loss of a great genius. Three Nobel Prize recipients addressed their tribute to "one of the outstanding intellects of the world who paved the way for many of the technological developments of modern times." One of the more controversial topics involving Nikola Tesla is what became of many of his technical and scientific papers after he died in 1943. Just before his death at the height of WWII, he claimed that he had perfected his "death beam." It was natural that the FBI and other U.S. Government agencies would be interested in any scientific ideas involving weaponry. Some worried that his papers might fall into enemy hands. The morning after Tesla's death his nephew Sava Kosanovic hurried to his uncle's room at the Hotel New Yorker. He was a rising Yugoslav official suspected to have connections with the communist party in his country. Tesla's body had already been removed, and Kosanovic suspected that someone had already gone through his uncle's things. Technical papers were missing as well as a black notebook he knew Tesla kept...with several hundred pages, some of which were marked "Government." The FBI was called to investigate, and it turned out that the government was vitally interested in preserving Tesla's papers, so the officials from the Office of Alien Property went to Tesla's room and impounded all his possessions. Dr. John G. Trump, an electrical engineer with the National Defense Research Committee of the Office of Scientific Research and Development, was called in to analyze the Tesla papers in OAP custody. Following a three-day investigation, Dr. Trump concluded: "His [Tesla's] thoughts and efforts during at least the past 15 years were primarily of a speculative, philosophical, and somewhat promotional character often concerned with the production and wireless transmission of power; but did not include new, sound, workable principles or methods for realizing such results." Just after World War II, there was a renewed interest in beam weapons. Copies of Tesla's papers on particle beam weaponry were sent to Patterson Air Force Base in Dayton, Ohio. An operation code-named "Project Nick" was heavily funded and placed under the command of Brigadier General L. C. Craigie to test the feasibility of Tesla's concept. Details of the experiments were never published, and the project was apparently discontinued. But something peculiar happened. The copies of Tesla's papers disappeared and nobody knows what happened to them. In 1952, Tesla's remaining papers and possessions were released to Sava Kosanovic´ and returned to Belgrade, Yugoslavia where a museum was created in the inventor's honor. For many years, under Tito's communist regime, it was extremely difficult for Western journalists and scholars to gain access to the Tesla archive in Yugoslavia; even then they were allowed to see only selected papers. This was not the case for Soviet scientists who came in delegations during the 1950s. Concerns increased in 1960 when Soviet Premier Khrushchev announced to the Supreme Soviet that "a new and fantastic weapon was in the hatching stage." Work on beam weapons also continued in the United States. In 1958 the Defense Advanced Research Projects Agency (DARPA) initiated a top-secret project code-named "Seesaw" at Lawrence Livermore Laboratory to develop a charged-particle beam weapon. More than ten years and twenty-seven million dollars later, the project was supposedly abandoned "because of the projected high costs associated with implementation as well as the formidable technical problems associated with propagating a beam through very long ranges in the atmosphere." Scientists associated with the project had no knowledge of Tesla's papers. In the late 1970s, there was fear that the Soviets may have achieved a technological breakthrough. Some U.S. defense analysts concluded that a large beam weapon facility was under construction near the Sino-Soviet border in Southern Russia. Nikola Tesla was a genius who basically fulfilled his desire to create wonderful things to benefit humanity. Unfortunately, other individuals are not motivated by the same high ideals. For a more comprehensive story about Telsa's accomplishments watch this video, and visit this website. If you're worried about global warming, below is an interesting article that appeared in the Union Newspaper November 12, 1977 "Is Russia secretly controlling climate?" Also here's Roy Spencer's website concerning the earth's own method for cleaning the atmosphere: In a nutshell Dr. Spencer says that "Sunlight is the source of energy for our weather, and so it makes sense that more (or less) sunlight will make the Earth warmer (or cooler). But the greenhouse effect (trapping if infrared heat) is the result of weather processes. Remember, most of the Earth's greenhouse effect (over 90%) is due to water vapor and clouds, and so it is under direct control of weather processes -- winds, evaporation, precipitation, etc. This cause-versus-effect role of the Earth's natural greenhouse effect is an important distinction. I mentioned above the common explanation that the Earth's "energy balance results in a roughly constant globally-averaged temperature". But I believe that this has cause and effect turned around: It is more accurate to say that "weather processes generate a greenhouse effect that is in proportion to the warming caused by sunlight". Unless we understand the processes that control the Earth's natural greenhouse effect, we can't hope to understand how mankind's small, 1% enhancement of the greenhouse effect will change global climate." His theory sounds logical when you look around at what the earth's done in the past with ice ages, glacier, and their melting leaving behind the carved valleys and mountains we now enjoy in America. It's January 8, 2008 3:06 pm at Nevada City, and we have about 8 inches of snow...and it's easy to see how it cleans up the atmosphere by returning all the dirt to the earth. Is Russia secretly controlling climate? "What the scientists have in their briefcases is frightening." Nikita Khrushchev. Ottawa -(NEA)- Last March, during a cold and clear evening, a strange extra-terrestrial phenomenon occurred over Ontario. As reported by Canadian government official Andrew Michrowski, "the sky lit up with sheets of light traveling in a 360-degree circle." Michrowski says the light pulsated, in a perfect pattern, for about an hour. The Aurora Borealis? The tailings of a UFO? Michrowski says he considered every possible explanation before deciding, gravely, that the sheet lightning was man-made, in the Union of Soviet Socialist Republics, and was part of an ongoing experiment by the Russians to modify the weather for agriculture and defense purposes. Michrowski, employed as a futurist in Canada's office of the secretary of state, had for some time suspected the Soviet Union in this regard. The sheet lightning activity sealed his opinion. He has spent the time since March trying to convince his government, and that of the U.S., that the world may be in new and imminent peril. And he's not alone in this belief. A growing number of mostly private citizens on the American continent are increasingly worried that the USSR is behind the recent souring of global climate conditions. Theirs is at best a frustrating interest. Few scientists believe the theory, and many of its advocates are considered to be wacky. No one doubts that, as late, the weather has indeed been odd. Last winter's record freeze on the eastern side of the U.S. and Canada was but part of a gradual cooling of the earth since 1940. Yet no government would say this is the Russian's doing. The conventional wisdom is pollution which masks the sun. Also, few scientists would doubt that weather modification techniques are actively coveted by super-power nations. In testimony before Congress in 1974, Dartmouth's Dr. Gordon MacDonald advised that climate control would perhaps be the ultimate "covert" weapon: "Storms, floods, droughts, earthquakes and tidal waves (are) viewed as unusual but not unexpected. (A secret climatic war) could go on for years with only (the perpetrating nation) being aware of it. The years of storms would be attributed to unkindly nature, and only after a nation was thoroughly drained would an armed takeover be attempted." But theory is one thing, application another. Dr. Andrija Puharich, a medical researcher from Ossining, New York, says he has "personally seen to it that Jimmy Carter is aware" of the alleged Russian interest, but he expects no thankful action for his troubles; "Nobody is listening," he says, "nobody believes it, nobody cares." Except the few, that is. Michrowski, Puharich and others care enough about the weather modifications possibility to risk their reputations in its exposure. And they seldom risk on the side of moderation. Says Dr. Puharich. "If the Russians can affect world weather, and I believe they can, it's the most ominous development on the planet." According to believers, the full gravity of the matter is as yet years away. ken Killich, a Canadian technician and science activist, says the Russians are now merely learning about weather modification. In fact, Killich says, the weather that has been altered by the Ussr to date has been done so through experimental error. Killich believes the Russians have set out to cultivate vast new arias of their nation, much the same as the U.S. and Canada did earlier in the century. Not wanting to create a dust bowl of their own, however, Killich says the Russians have been trying to stimulate the climate to do the biddins of ground-bound button pushers. Instead of just influencing their own region, though, Killich says the Soviets have "lost control" and hence have affected the world. Michrowski adds the opinion that Soviet experiments in the last year were responsible for shifts in massive high pressure fronts; these shifts backfired, giving the Soviet Union "a lousy winter too." Just what it is the Reds may be doing wrong is unknown. This is partly because no one knows what it is the nation may be working with. The only thing Russian critics do know, they say, is that the Soviet experiments are based on the work of a Yuoslav-American scientist named Nikola Tesla. Who is Tesla? That's a story in itself.